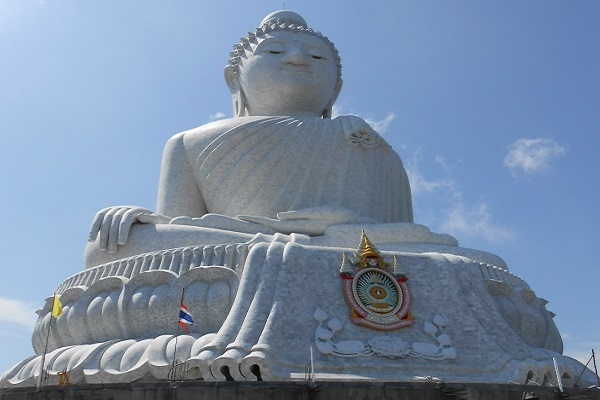 The 45 metre (147 feet) tall marble Buddha sits on one of the highest peaks at Khao Nakkerd Hill. Visible from most places in the south of the island, the Big Buddha has become an important religious symbol for Buddhists on the island as well a great tourist attraction with an amazing 360 degree view of the south of Phuket. Construction began in 2004 and has been funded entirely through donations. As of 2012 the Buddha statue itself is completed although the huge base which will include a giant marbled lotus leaf are still under construction. At the base of the Big Buddha is a hall which a display showing the history of the project as well as donation boxes. Entry to the Big Buddha is free but donations are very much appreciated. At the end of the hall there are monks who can accept offerings for merit making while providing blessings. One way of contributing a donation is to purchase a block of marble which you can write your name on and will be used in the construction. Avoid beachwear, short skirts and T-shirts with offensive texts or images. If you feel you have dressed a little too daringly for a religious site you can always ask for a sarong to cover up with from the site centre, free of charge. The road leading up to the Big Buddha is off Chao Fa Road East near Chalong. There are many red-and-white signs indicating where it is. Turn down Soi Yodsane and simply follow the indications for the next six kilometres up the hill. You can’t miss it.